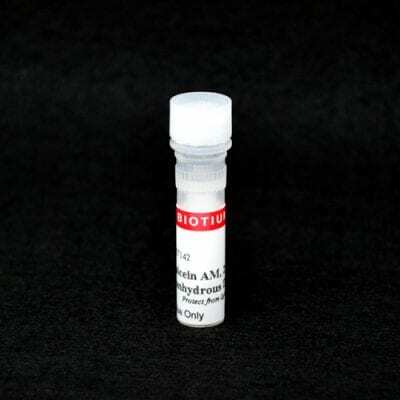 Calcein AM is a widely used green fluorescent cell marker. Calcein AM is membrane-permeant and thus can be introduced into cells via incubation. Once inside the cells, calcein AM, a nonfluorescent molecule itself, is hydrolyzed by endogenous esterase into the highly negatively charged green fluorescent calcein. 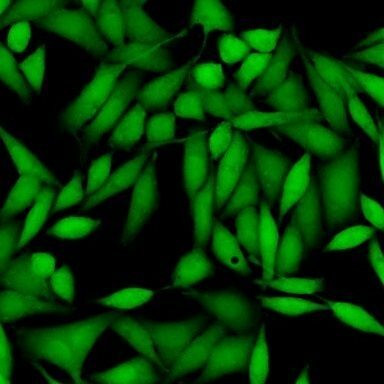 Green fluorescent calcein is retained in the cytoplasm in live cells. Calcein AM has served as a useful tool for the studies of cell membrane integrity and for cell tracing. The Calcein AM Cell Viability Assay Kit is designed to quantify live cell numbers based on their endogenous esterase activity and plasma membrane integrity. It is a true end-point assay for cell viability. The fluorescent signal is monitored using 485 nm excitation wavelength and 530 nm emission wavelength. The fluorescent signal generated from the assay is proportional to the number of living cells in the sample. We also supply Calcein AM in a variety of packaging sizes and formats. 1. J Neurosci Methods. 50, 205 (1993). 2. J Immunol Methods 163,181 (1993). 3. Cancer Lett. 87, 199 (1994). 4. J Immunol Methods 178, 41 (1995).